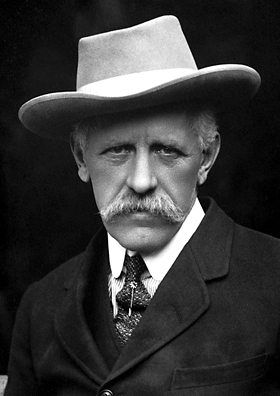 FRIDTJOF NANSEN ( 1861 – 1930 ) Explorer, scientist, statesman and humanitarian. Nansen crossed Greenland’s icecap together with six companions, and for this achievment he was made curator of the Museum of Contemporary Anatomy at the University of Kristiania ( Oslo ) in 1890. Between 1893 -1896 he planned and executed a daring Artic expedition in his ship Fram . The ship was constructed such that it could be lifted and not crushed by pack ice. The purpose of his expedition was to test his theory on polar currents, which was subsequently proven correct. During the expedition he and Hjalmar Johansen left the ship in an attempt to reach the North Pole by dogsled. They reached father north than anyone had previously been, but were forced to turn back due to severe weather conditions and stayed over the winter in Franz Josef land. They returned to Norway 8 days before the return of the Fram . Nansen’s interest turned to oceanography and he became the director of ” The International Commission for Systematic Ocean Study” in 1901, and led several expeditions, until the arrival of World War 1 brought it all to a halt. He advocated the peaceful separation of Norway from Sweden in 1905 and served as the Norwegian Minister to Great Britain from 1906 – 1908. He was Norway’s delegate to the Leauge of Nations from 1920 – 1930. As the Sovjet Union did not recognise the organisation, he accepted the responsibility for the repatriation of prisoners of war refugees. The organisation came to the rescue of millions of people from Russia, Greece and Rumania. He devised an international identity certificate called – “The Nansen Pass” for stateless people. For this he received the Nobel Peace Prize in 1922. Nansen wrote many books during his lifetime: ” Across Greenland” in 1891. ” Eskimo Life” in1893 ” . ” Russia and Peace ” in 1922 and “Armenia and the new East” in 1928 to name a few. There have been many books written about Nansen and his lifetime. Nansen’s home at Polhøgda is now ” The Fridtjof Nansen Institute” engaged in research in international environmental energy and resource management politics. The Institute maintains a multidisciplinary approach with the main emphasis on political science, ecomonics and international law. We in the Anglo-Norse Society Oslo branch are proud to honour our first President and the first Norwegian Ambassador to Great Britain.